Some time ago I wrote a piece on celibacy, and I talked about how I put myself on a pedestal for being able to check off on a list of things that I believed made me an ideal Christian woman. I had this idealized vision of who I was, and who I was supposed to be, and became more concerned with maintaining that image than I was concerned about really loving and honoring God. And then… life happened. As determined as I was to not stumble, mistakes were made, and I was forced to grapple with the reality of my propensity to sin. Throughout all of my adolescence I did everything in my power to follow the rules perfectly, but it still never seemed to be enough. Consequently, I grew exhausted of the constant pressure to look like holiness, act like holiness, and never mess up–ever. In my hurt and bitterness, it seemed utterly pointless to keep striving towards holiness, because regardless of my efforts, regardless of checking off on just about everything on my good-Christian-girl-checklist, I still fell short in some way. I was hurt, I was exhausted, and I just couldn’t see the point in striving anymore. Holiness became synonymous to perfection in my head, and it seemed to me an impossible feat, especially because I was trying to be holy by my own works, in my own strength, and for my own purpose–proving the “haters” wrong. …and I completely agree with that. Holiness is indeed a process, a continuing day-to-day commitment to becoming more like God and less like ourselves. God has taught me to be less concerned with looking the part, and more concerned with actually living to please Him. He’s taught me to reject feigning perfection, and to stop being obsessed with the idea of a testimony of perfection. The reality of my story is, I’ve been tempted, and there have been times when I didn’t use my way of escape. I’ve stumbled, I’ve made mistakes, I’ve had to repent. There have been nights when I literally laid out on my bedroom floor and cried, and dealt with God’s loving chastisement, repented, and experienced His grace through forgiveness. I am a witness to the fact that God will never discount you, never give up on you, and will never relegate you to a category of “less than” even when others do. His love literally covers all. And His grace is what sustains every single one of us. The reality is, all of us have had struggles and missteps in our walk that we are not proud of, or are afraid to confess to anyone but God. I just wish more of us felt safe enough to share those missteps and how we overcame them, instead of seeing them as things that discredit us or as reasons to be silent. I wish more of us would come to the realization that God really can use our imperfections in the process of perfecting us for His purpose. Recently, God has been dealing with me, and He’s revealed to me that there are doors that will open up for me, and platforms that will be made accessible to me, but those doors and platforms will require all of me–the good, and the messy, and complicated parts of me, and I can’t shy away from that. I pray that we will walk in truth, and learn how to be less judgmental so we can be more transparent with one another. I pray that we stop finding our worthiness in the fact that we haven’t sinned in particular ways. I pray that every time we are tempted to discredit someone’s testimony or salvation because of a sin (we happen to know) they’ve committed, that God will bring us face to face with the sin(s) He forgave us of that we want no one to know of or talk about. I pray that any young man or woman who comes across this piece and is struggling with feelings of insecurity and inferiority, will come to believe that the testimony you have is valuable and is not less than the one to which you aspired. Your testimony is not less than anyone else’s for that matter; God has brought all of us from something. It’s only His grace that keeps us, and It’s only His grace that makes holiness worth striving for and possible. Ashlee Wisdom is a graduate of Howard University, where she received a B.S. in Psychology and minor in Biology. In her free time, she likes to hide in quaint coffee shops in Harlem doing nerdy stuff. 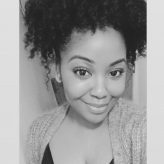 She’s an avid reader, writer, and bruncher, and she’s most passionate about her faith in Jesus Christ, Black feminism, and combating racial, ethnic, and socioeconomic disparities in healthcare. Ashlee is currently pursuing her Masters in Public Health Policy at NYU. You can follow her @AshleeWisdom.